The Battering Ram Q is basically a Battering Ram V2.6 but with a four band parametric EQ in front of it. You can choose to just have EQ, or EQ going into the overdrive, or EQ going into the fuzz, or EQ going into overdrive and fuzz in parallel. The Battering Ram Q works equally well for guitar or bass or anything else you want to plug into it. The EQ section is on when the pedal is turned on. Overdrive + Fuzz means that the overdrive and fuzz channels can work in parallel or separately, each channel receiving the signal from the EQ, working their magic and then mixed back together at the output. The Overdrive channel with it's Gain, Treble and Level controls is switched on via the Overdrive stomp switch while the Fuzz channel has it's own stomp switch and Gain, Tone, and Level controls. The Octave stomp switch changes the fuzz channel into an octave up fuzz. True bypass stomp switch to turn the entire unit on/off. Requires a 9 volt DC adaptor, or a 9V battery. Standard pedal adaptors like Boss PSA, Godlyke Powerall, Onespot. There is a 2-3 week turnaround on the Battering Ram Q1 because we don't currently have the boxes in stock. 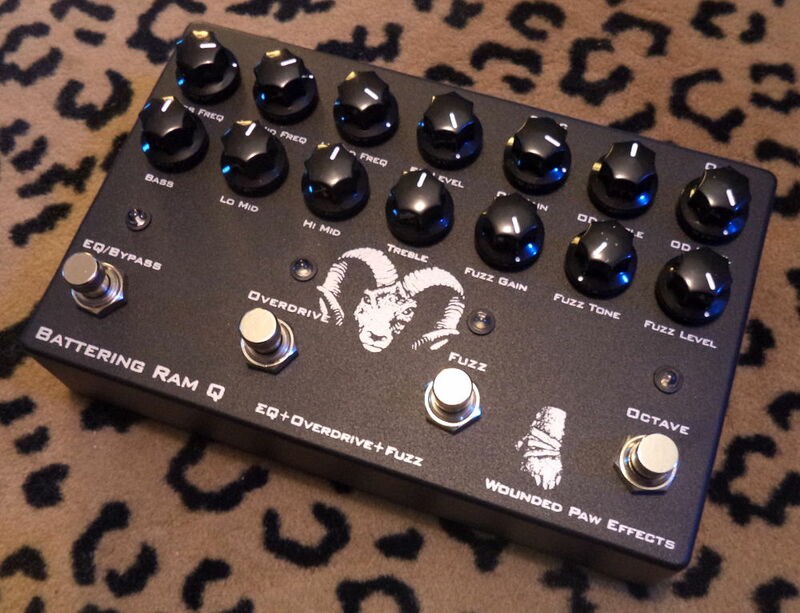 Great write-up of the Battering Ram Q on a German bass site.